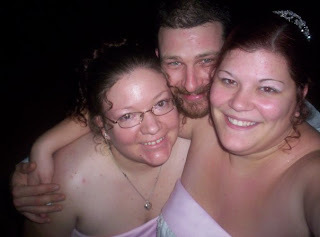 Ramblings of a Daydreamer: Happy Anniversary to my brother and sister-in-law! Happy Anniversary to my brother and sister-in-law! Today, my brother Jamie and sister-in-law Amanda celebrate their 4th wedding anniversary. They've been together for a little over ten years and have two beautiful children, Noah (8), and Logan (9 months). We've had some hard times and some issues as a family...things I won't go into because it's not fair to anyone to relive it when it's in the past and doesn't matter now...but as a family right now, there's nothing I would change. It took us a long time and a lot of bumps to get here, but I think I can say we're all happy and loving life and each other. My brother and I are super close and always have been. He was 10 when I was born and from the moment I was born, he was my protector, and almost 27 years later, he remains my protector. We have a really strong bond and have always been able to communicate without saying a word - just a look or raised eyebrow or grin will say it all. Jamie isn't just my brother, he's one of my closest friends. Amanda and I have had our issues in the past...we haven't always gotten along, but in the last year, she's been one of the best friends I've ever had and has been there for me whenever I needed her. It's funny, it took some really bad stuff happening to make us realize how important we are to each other, and to really bond...now it feels like we've been friends forever...we always say the same things at the same time, know what the other is thinking and finish each others sentences. We spend a lot of time together, make a lot of plans for the future, laugh like maniacs over stupid stuff and learn things together...it's what I always wanted, and she's the best sister and friend I could ask for. Their wedding day was one of the best nights of my life. The weeks leading up to it were pure chaos because we planned the whole thing ourselves and did all the work, and even the morning of the wedding was stressful, but the minute the wedding march began to play, everything was perfect. I started to cry the moment I saw my brother at the front of the hall, so handsome and relaxed, despite the fact that we were an hour late. I think I cried through the whole ceremony...I could see Jamie's face the whole time and his eyes were so full of love as he watched Amanda, it made my heart ache, and I kept thinking how happy I was for them, and that I hoped some day, I'd find a man who looked at me with such love in his eyes and would be as anxious to marry me as Jamie was with Amanda. The ceremony was beautiful and the reception was so much fun, we laughed and danced and ate and had a great time. It's actually hard to believe that four years ago right now, it was happening...sometimes it feels like longer, and sometimes it feels like yesterday. So that's just a little tribute to my brother and sister-in-law, who mean the world to me. Wishing you guys a very happy anniversary and many more happy, healthy, love-filled years together (and a niece would be nice too lol). Love you guys! Nice post. My wedding day is also approaching soon and we are quite excited but nervous at the same time. It will be a DIY ceremony at the most beautiful beachside wedding venues in LA so recently we are busy in wedding arrangements. Hoping for the best!